PETER FERRY, called “the ingenious percussionist Peter Ferry” (Chicago Sun-Times) and “an artist of vision” (Democrat and Chronicle), is a young American percussion soloist and artistic collaborator. Following his concerto debut at age 18, Ferry has championed the works of living composers, including Michael Daugherty, who has praised Ferry as “one of the most promising and committed soloists of his generation.” A TEDx speaker, Ferry has collaborated with choreographer Nick Pupillo at Chicago’s Harris Theater and abroad at the European Museum of Modern Glass where he was nominated for the Coburg Prize. 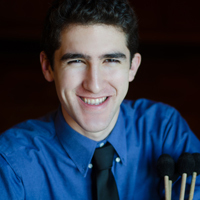 An alumnus of the Eastman School of Music, Ferry graduated with the first ever John Beck Percussion Scholarship, an Arts Leadership Program certificate, and the prestigious Performer’s Certificate recognizing outstanding performing ability.